※ If you have any questions or problems when using, please feel free to contact us by Amazon message or sending mail to xiaoshihouhq@outlook.com and we will solve the problems for you within 24 hours immediately. ※ We provide 12 months worry-free warranty, friendly after-sale customer service and life-long time technical support. ※ If you want more people to help you solve your problems, you can share them on Amazon Q&A. ✦ High Gain Long-Range 5dBi Antenna: Brings better wifi connection than USB wifi adapters with other antenna. ✦ Standards: 802.11ac, backward compatible with 802.11 a/b/g/n wireless standards products. ✦ Supports dual band wireless dongle: 2.4G/300Mbps+5G/867Mbps. ✦ Support System: Windows XP/Vista/7/8/8.1/10/ Mac OS X 10.4-10.14.1/Linux( Kernel 2.6x-4.7x). ✦ Security: WFA, WPS, WPA2, WPS2.0, WAPI. Step 2: Open the "Setup.exe" in CD, and install the driver. Step 3: Insert the AMBOLOVE WiFi Adapter. 1. Please do not insert it into the USB port of your devices for a long time, sometimes you need to pull it out. In addtion, make sure the device current is not too high. 2. Keep your hands off while detecting overheat in case you get burned. 3. Any query about the wifi adapter, feel free to contact us for better solution. 4. If your computer or other machines don't have a place to insert the CD, please use online link to download the driver: https://goo.gl/nNPK7v. If you have any questions about this product by AMBOLOVE, contact us by completing and submitting the form below. If you are looking for a specif part number, please include it with your message. 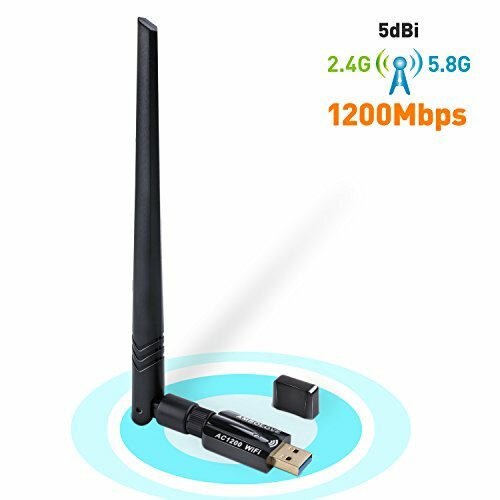 Wsky Wireless USB Wifi Adapter - Newest WPS Secure Tech - 600M Dual Band (2.4G/150Mbps+5G/433Mbps) - Usb Wireless Network Adapter - Unique Design Brings Easy and Free Wireless Digital Life!